Last night, April 27th, “The Stars Come Out” theatrical extravaganza was held at Georgian College’s Gryphon Theatre. Great Lakes Brewery fundraiser BBQ in support of The Gatehouse. Great Lakes Brewery fundraiser BBQ in support of The Gatehouse. Heal a child and heal a world. Come help us celebrate the launch of summer with a BBQ for the whole family at the 6th annual Great Lakes Brewery party in support of The Gatehouse in Etobicoke. We will be there too to lend our support….hear a child and heal the world. On May 23rd Great Lakes Brewery will be donating all profits from the day’s sales at the BBQ in Etobicoke and all the sales of the LCBO and Beer Stores to The Gatehouse. Great Lakes Brewery is Toronto’s oldest craft brewery including popular beer brands like; Golden Horseshoe Premium Lager, Red Leaf Smooth Red Lager and with spring now here, the newest seasonal beer – Green Tea Ale! All brewed using a historic fire-brewed copper kettle. The Gatehouse offers unique services to the needs of children and their families, youth and adults whose lives have been affected by childhood abuse. A safe and comfortable environment like The Gatehouse gives people a comforting place where they can feel supported. The Gatehouse is a safe place for children to disclose to the police and child welfare the abusive events that have affected their lives. We will be there too in support of The Gatehouse representing the wine lovers of the world! We’ll be pouring the popular Girls Night Out Wines www.girlsnightoutwines.com , a trio of VQA (so you know it’s good Girls’ Night Chardonnay, Merlot and Merlot/Chardonnay. All profits to be donated to The GateHouse. And don’t cry over spilt wine wear it! Introducing The Wine Ladies T-shirts dyed in real grapes! All of our t-shirts are made with 100% cotton. They are preshrunk and colour fast when washed in cold water with “like” colours. Our T-shirts make for a memorable gift for the wine lover in you and your friends. Order you’re The Wine Ladies T-shirt here. We’ll also have these shirts available for sale at the BBQ and a portion of the sale will go directly to The Gatehouse. See you there and make sure to pick one up! https://www.thewineladies.com/wp-content/uploads/2017/08/WineLadiesLogoTransparent.png 0 0 Susanne Seelig-Mense https://www.thewineladies.com/wp-content/uploads/2017/08/WineLadiesLogoTransparent.png Susanne Seelig-Mense2009-04-29 12:00:012018-06-06 19:27:15Great Lakes Brewery fundraiser BBQ in support of The Gatehouse. I enjoyed reading about “green wine”, or Vinho Verde in last weeks column, but would now like to ask you about a “yellow wine” otherwise known as Vin Jaune. A wine we had never heard of until recently and found to be very interesting in flavor. What is Vin Jaune? Is this a place or a grape? Clos Pegase, where Art and Wine Intertwine in Napa. Clos Pegase, where Art and Wine Intertwine in Napa.Henry Moore, Salvador Dali, Francis Bacon and more will all be present on our up-coming Napa Tour! Clos Pegase Winery, located in the scenic Calistoga, is a stunning example of Postmodernist architecture surrounding, and housing the winemaker’s wines of quiet elegance. https://www.thewineladies.com/wp-content/uploads/2017/08/WineLadiesLogoTransparent.png 0 0 Susanne Seelig-Mense https://www.thewineladies.com/wp-content/uploads/2017/08/WineLadiesLogoTransparent.png Susanne Seelig-Mense2009-04-22 12:00:012009-04-22 12:00:01Clos Pegase, where Art and Wine Intertwine in Napa. Set that dial to CP24 Radio1050 every Saturday morning at 10a.m. to connect with The Wine Ladies radio show. Waxing the upper lip not always the way to go! Try Winning Colours Stain Remover instead! After a fun filled action packed day at the recent Food and Drink Fest, I emerged from the Hamilton Convention Centre with Patricia Miles, National Sales Manager of Winning Brands to discover some pranksters had drawn mustaches on Georgia’s and my faces on our promotional vehicle. https://www.thewineladies.com/wp-content/uploads/2017/08/WineLadiesLogoTransparent.png 0 0 Susanne Seelig-Mense https://www.thewineladies.com/wp-content/uploads/2017/08/WineLadiesLogoTransparent.png Susanne Seelig-Mense2009-04-13 12:00:012009-04-13 12:00:01Waxing the upper lip not always the way to go! Try Winning Colours Stain Remover instead! 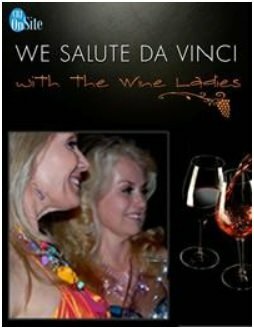 The Wine Ladies, Canadian entrepreneurs featured in The Canadian Business Journal. About a month ago, one of my best friends Linda (Susanne speaking here) was on a business trip headed to Vancouver. She had the good fortune of sitting beside the Editor In Chief of The Canadian Business Journal, the dynamic, charming and intelligent Sara Kopamees. With over 5 hours to kill, the conversation turned to who you know, what you do etc. And lo and behold my loyal friend Linda spilled the beans! Intrigued by our entrepreneurial story, Sara contacted us and invited us to be featured in the April 2009 edition of The Canadian Business Journal. We always wanted an opportunity to tell our entrepreneurial “The Wine Ladies “story and now you can read all about it here in a joint story written by Sara and George Media Associate Editor Jen Sorlie. How our adventure began, what Georgia likes, Susanne’s pet peeves, our philosophy on The Wine Ladies brand and our mega plans for the future! Please read here for all the details. The Canadian Business Journal is essential reading for Canada’s top executives who want to stay informed of current industry topics and trends. It offers readers a glimpse into major Canadian industries including construction, energy, food and drink, healthcare, manufacturing, and more, through comprehensive profiles of successful Canadian enterprises. The magazine also features articles and columns from Canadian writers focused on all aspects of the Canadian business landscape, from environmental to legal to safety issues. Through the CBJ, readers are able to access illuminating interviews with key public figures and regulatory bodies. The magazine also covers high-profile industry events and snapshots into business life in the special “CBJ Onsite” section. https://www.thewineladies.com/wp-content/uploads/2009/04/images_CanadianBusinessJournal.jpg 328 254 Susanne Seelig-Mense https://www.thewineladies.com/wp-content/uploads/2017/08/WineLadiesLogoTransparent.png Susanne Seelig-Mense2009-04-13 12:00:012009-04-13 12:00:01The Wine Ladies, Canadian entrepreneurs featured in The Canadian Business Journal. The Girl Guides of Ontario were involved in a recycling program of wine corks in conjunction with a company called Jelinek Cork Group a couple of years ago. Unfortunately I haven’t seen or heard any more of this for quite a while. Is there still a recycling program in place? Are there any others?